Disclaimer: Victory Point Games sent me a copy of this for review. Between 1640 and 1653 a series of civil wars were fought in England that I have no earthly interest in. Pikes and muskets? Oliver Cromwell and King Charles? Parliamentarians and Puritans and Catholics and Monarchs and … yawn. None of that has ever piqued my interest. And then I played Cruel Necessity. This is a Gold Banner game, meaning it has extra-thick laser-cut counters (complete with soot that must be wiped away before play), full-sized cards on excellent stock, and a beautiful map that benefits from Victory Point Games’ recent focus on terrific graphic design. The 20-page rulebook is packed with images and examples, and a nice cardstock sheet with a color player aid and optional rules is also included. Unlike most of VPG’s recent games this one doesn’t have a mounted map due to its size, but that is of no concern. The two-piece cardstock map is high quality and has stood up well despite me pushing counters all over the thing. The only problem I had with it is that it’s easy to cover up the red (negative) and blue (positive) triangles printed next to objectives on it that are counted to keep track of your score, but you soon adapt. VPG used to put ludicrously tiny dice in its games but this one has one medium-sized red d6 and one medium-sized blue d6 that are used to resolve nearly everything. 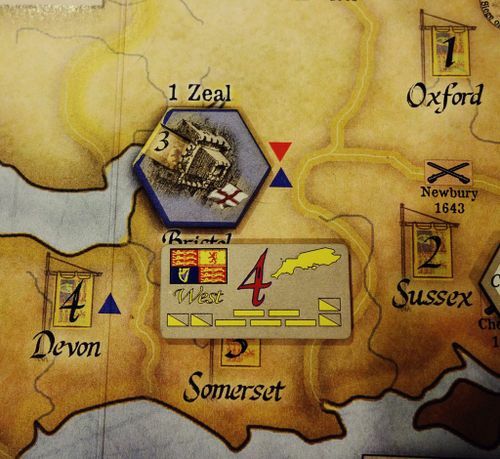 The English Civil Wars flared up throughout a long stretch, represented here by three scenarios that can be linked together into a long campaign. It uses Victory Points Games’ flexible States of Siege engine, but on a much grander scale that what we’re used to. Scottish, Irish, Northern, and Western armies march inexorably down separate numbered tracks towards London, and you must bat them back while maintaining and overtaking forts in their path that slow their advance. Meanwhile, you must prop up support on six separate political tracks (Scotland, Ireland, Monarchy, Parliament, Catholicism, Protestantism), each graded from A to F. You lose if London falls or if four of the political tracks ever descend into the F category. The main tool you use to turn down the heat on these ten different pressure cookers is Zeal, which amounts to action points you spend for various things at the end of each turn. 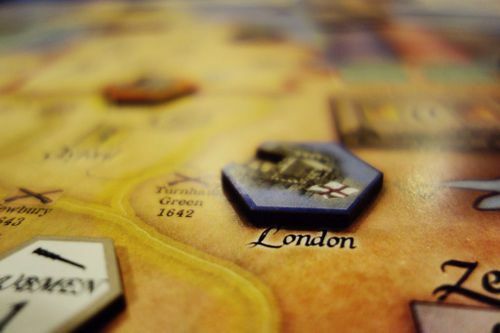 As long as you control London you get three Zeal points every turn, and you can earn up to three more for controlling key forts on the map. Unused Zeal carries over from turn to turn (though you can never have more than nine points), which is important for purchasing Achievement Cards sprinkled throughout the draw deck. Achievement Cards can only be acquired if strict conditions on them are met and their Zeal cost is spent (ranging from two to a ton of points). They are game-changes for the situational yet always beneficial special abilities they trigger and also for the points you collect when you get them. All of the other points you can gain in the game are in flux, varying depending on how you’re faring on the battlefields and the political tracks, but points on Achievement Cards are permanent and significant. The draw deck where Achievement and Event Cards are found drives the game. It is divided into three separate decks representing three distinct phases of the English Civil War. Though the cards at the beginning and end of each deck are fixed, all the rest are shuffled to ensure no two games are ever the same. At the start of each turn you draw the top card off the deck and resolve all of the icons and text on it from top to bottom. If it is an Achievement Card you put it in one of the three Available Achievement slots at the top of the map and keep drawing cards until you get one that must be resolved. If all the Available Achievement slots are full you must discard one of the existing ones to place the new one, meaning it is always a race to pick up juicy cards before they are removed from the game. After the battle modifiers based on the results are applied, and one or more of the armies on the board activate. They can become disordered via various effects, in which case activation flips them to their stronger, ordered side. If they are already on that side they march down their track into the next lower-numbered territory, becoming a bigger threat to your cause. If a fort you control is in the territory an enemy army occupies it is besieged. Forts are hexagons with a little notch cut into one side that displays their current strength (ranging from zero to three, or four in the case of Oxford). When they are fortified you rotate them one hex-side clockwise. When they are besieged by your enemy you roll a die, see if it is greater than the current strength of the fort, and if it is you rotate the fort one hex-side counter-clockwise. Then you roll one more die and repeat the process. If a fort is ever reduced to zero strength it is flipped to its opposite side to represent its new ownership and raised to two strength. After armies are activated there is sometimes additional text that forces you to fortify an enemy-controlled fort or besiege one of your own forts. There also are sometimes political and religious reactions, unrest in London, or other effects that trigger to your detriment. Some of these effects make you place Deviltry or Revolt markers on the board that lower your score and must be overcome to remove their other ill effects. Once that’s all done you resolve the center section of the card, which often forces you to move one of the political track markers up or down on its track. Sometimes it adds a +1 or -1 dice roll modifier token to a track that makes it harder or easier to adjust that track later in your turn. Then you move on to the bottom section of the card, which also often makes you adjust a track or apply a modifier. This lets you put a +1 marker on any political track, army, or other marker, adding one to all of your dice rolls applied to it for the entire turn. It stinks to spend an entire action to do this, but the math works out such that even a measly +1 can make a tremendous difference, so it is always tempting. Each army has a strength (which is reduced by one point if they are disordered), and if you roll higher than it on a single die you get to move them back to the next higher-numbered territory. If they are already in their highest-numbered territory you can flip them to their disordered side. When attacking Deviltry markers you simply need to roll higher than two, and you then flip the marker to its opposite side to gain a random boon. You can only do this if the armies on their track are in a higher-numbered region or are disordered in that region, and you only get to roll one die. If the die is higher than the value of the fort, you reduce its strength by one “click”, and if it is ever reduced to zero you get to flip the fort over and put its strength at two, gaining control. Revolt markers require only one successful roll to remove, and are vexing because you can’t campaign in or affect forts in the region they are in until they are removed. This can only be done as long as the enemy army on that track is in a higher-numbered area than the fort’s location. Doing this requires only that you spend one Zeal to turn the fort one hex-side clockwise, with the restriction that you may only do so two times per fort per turn. Propping up forts before enemy armies get there burns up a lot of Zeal, but can really buy you a lot of time. And even though the fort in London is not threatened by invading armies at the beginning of the game it is directly targeted by cards that reduce its strength, making it important to fortify. While it is crucial to deal with everything that is happening all over the map, it is just as critical to use Zeal to deal with the political tracks. Each space on each track has a number printed on it, and you can spend one Zeal point to target a marker, roll a die, and move the marker one space higher on the track if the die is greater than the number under the marker. Getting these markers into their highest positions often grants bonuses and is also the only way to meet the requirements needed to obtain most of the Achievement Cards. It takes one Zeal point to grant you the option to buy a single card, and each card also has a Zeal cost printed on it, meaning that buying just one of them could consume an entire turn. They also have strict conditions that must be met before they can be purchased, which are nearly impossible to meet for some of the more potent cards. You will not win this game without buying Achievement Cards and banking their permanent points (not to mention using their powerful special abilities). Battles crop up frequently in this game, and are handled differently than in any other States of Siege title I’ve played. At the beginning of each one you decide if you’re fighting against the North or West Army. If you win a Victory that army becomes disordered and you have the potential to gain some other benefits. If you don’t you lose at least one Zeal point, and sometimes much, much more. Each side gets a handful of Cavalry units and a bagful of Musket & Pike units that are randomly assigned to corresponding slots in four Sections of the Battle Display Mat at the beginning of each fight. These each have a combat value printed on them ranging from one to six, and some are powerful Named Units. 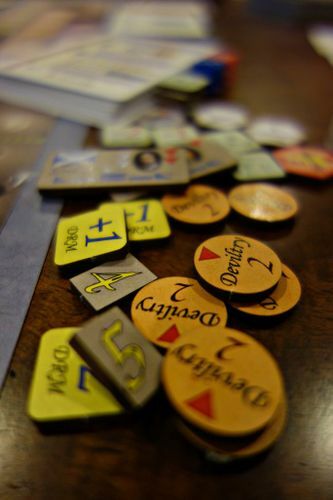 You begin the game with no Named Units, but they are gradually introduced as the game progresses. They make a tremendous difference because they are powerful units and you have the option to place them wherever you want before filling the rest of the slots randomly. The catch is any Named Unit that loses during that battle is subject to being unavailable for a turn or even removed permanently from the game. Fortunately the catch works both ways, as enemy Named Units are also eligible for permanent removal if you kick the snot out of them. A few units have the word Event printed on them, which forces you to draw one card off of the top of the Battle Event Deck. These cards often gut your army or give your opponent an advantage, but some are beneficial and you can hold on to them to unleash their benefits at an opportune time. Once the units are arranged across from one another combat is resolved beginning with the Cavalry units opposing one another in the First Section. 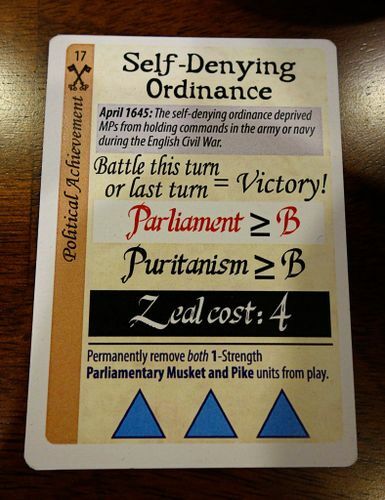 You roll a red and a blue die, adding the number on the red one to the Royalist unit’s combat value and the blue one to your Parliamentary unit’s combat value. Then you apply any modifiers in effect and compare the final totals. If your total is higher by two or more points you move your unit to the Victory box, and if it is fighting an enemy Named Unit that unit goes to the Defeat box. If the two totals are within a point of one another your unit goes to the Draw box. If your total is lower than the enemy’s by two or more points your unit goes to the Defeat box. This process is repeated for the Cavalry units in the Second Section, then all of the Musket & Pike units in the Third Section, and finally for all the Musket & Pike units in the Fourth Section. Once everyone has fought you count the number of units you have in the Victory, Draw, and Defeat boxes and the one with the highest total becomes the outcome of the battle (you can move all units from the Victory box to the Draw box if that would prevent a Defeat from being triggered). 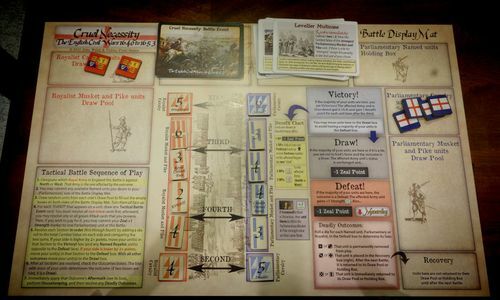 As mentioned, a Victory result causes the army you are fighting to flip to its disordered side, and if you have four or more units in that box each one after the third grants you a Benefit Point that you can spend to gain Zeal, adjust markers on the political tracks, or weaken enemy armies for one round. Draws cause you to lose one Zeal point, and are the most typical result by far, especially before you start accumulating Named Units. Defeats are awful. You lose a Zeal point, the Monarchy track is reduced one level, the army you were fighting gains one strength point for the entire round, and you must roll for every named unit there (including enemies) to see if they must spend a turn recovering or are removed permanently. This combat system adds significantly to the game time, and there is an optional system that lets you resolve the entire thing by rolling two dice and adding some modifiers. Initially I was lukewarm on it, but as things progressed and I became more familiar with it I decided it’s a tremendous addition to the game. Even though there are a lot of Draws, it’s nice getting a more granular overview of all the swings that led to them than a simple dice roll could give. The Battle Event Deck is interesting and can throw a real wrench into your plans (or, more rarely, a lifeline into your hands). The fact that you get to keep cards that are beneficial to you also enhances decision-making during battles, as the effects those cards have can be potent if unleashed at the right time. 2 July 1644: A combined army of Scottish Covenanters and English Parliamentarians defeats Prince Rupert’s Royalist forces. Cromwell leads the decisive, battle-winning cavalry charge. I immediately put Ironsides and Cromwell into action on the Battle Mat, then filled in the rest of the forces. Prince Rupert himself (a 5-strength cavalry unit) was facing off against Cromwell in the First Section, and the dastardly cur had vexed me in a series of battles leading up to this one. Making matter worse, I was forced to draw an event card and Boye the Battle Poodle came up, giving Rupert +2 strength (Rupert really did have a white battle poodle named Boye, who was given the rank of Sergeant-Major-General and who died on the field during the real Battle of Marston Moore). I had no good cards to use, and was immediately in a position of potentially losing Cromwell just after I gained him. Instead my dice rolls magically paralleled those of history and Cromwell crushed Rupert and his feisty pet. 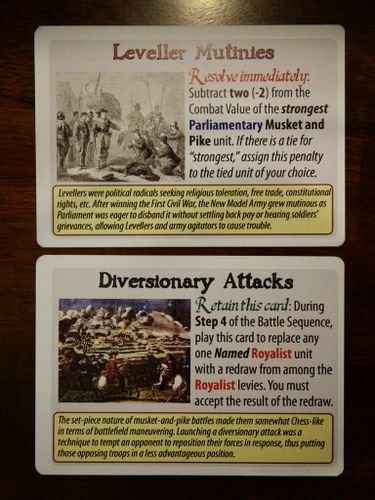 His victory there granted a +3 bonus to the Musket & Pike units next to him, letting them crush their enemies as well, and the battle ended in a Victory, just as the card text predicted. Rupert rolled badly in the defeat box and was eliminated from the game. It was A Moment. Yes, because Zeal can be spent in so many ways, all of which are important. You have to weigh the long-term goal of setting up and saving up for Achievement Card purchases against the short-term crises caused by events on the map and political tracks. And the order you purchase Achievement Cards in can be important for setting up combos that give you extra breathing room. There are always more things to do than you can reasonably accomplish, which is always the sign of a good game. The Battle Mat offers fewer interesting decisions, particularly at the beginning of the game when you are stuck with no Named Units and have no beneficial cards. It gets better as those things are added to your arsenal, but there’s still enough randomness that the battles are more spectacle than anything. The downside to all this is that an unlucky string of dice rolls (or an unfortunate series of card draws) can really cripple you. This can be mitigated to some degree by spending Zeal to add the +1 modifier (you can even do this to one unit in each combat), but the way the math works in this game means that the outcome of many a decision relies on what amounts to a coin flip. It is a testament to the design that even an entire turn of bad rolls won’t knock you out of the game (nor will a turn of good rolls guarantee much breathing room), but it always stings when a sensible plan is thwarted solely by fate. Is There a Clear Sense of Accomplishment or Failure? 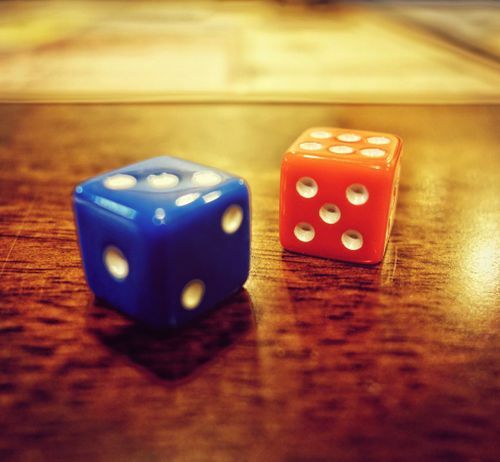 The prevalence of dice rolls and random card draws can often make it feel like outcomes are beyond your control, but there are so many decision points and so much room for strategy that overall you are responsible for much of your success or failure. You must pay attention to modifiers, keep the right armies at bay, manage your cards to get the most out of them, and work diligently to snap up all-important Achievement Cards that will ultimately decide whether you win or lose. There is a lot to keep track of in this game, and while your first few goes will seem like pure chaos it doesn’t take long to get to know the decks and how to best spend your limited resources to mitigate their ill effects. If There is a Theme, is it Tightly Integrated With the Design? The amount of research that was done for this game becomes apparent from the first turn, and all of it contributes to both the design and the theme. You can learn a lot about the history of this series of conflicts just by reading the flavor text on each card as it comes up, and each campaign creates its own unique narrative. The way opposing forces on the political tracks work is excellent, as are the special rules that trigger if the Irish and/or Scottish armies reach their lowest-numbered territories. The way forts work is also thematic, elegantly designed, and a wonderful addition the the States of Siege series. I hope more games using this engine employ something similar to make army invasions more interactive. I also admired the way the combat model creates a historical story arc. Things are grim at the beginning, but Named Units are slowly introduced to your side and you have the opportunity to do things like remove your weakest units from the game so they don’t bog down your random draws. Over time your Defeats start turning into Draws, and your Draws start turning into Victories. Sometimes enemy Named Units die, and the boons from the battlefield help assuage some of the pain facing you on the political tracks and game map. John Welch did a terrific job of elegantly incorporating various aspects of the war into the design without bogging it down at all. The Clubmen are the best example I can think of. Historically, Clubmen were people who rooted for neither side in the war, wanted to be left alone, and would fight whatever faction happened to show up in their village to levy troops or commandeer supplies. They appear in the game as tokens with 1 strength that pop up on the map at various times, and depending on where they land they can hinder either the Royalists or your efforts. They are easy to get rid of, but you must waste a precious Zeal point to do so (while still taking a small risk), and they do a tremendous job of modeling their historical role while adding almost no overhead. Welch has really outdone himself with this design. It is obvious that a great deal of playtesting was done to incorporate his extensive research into an ambitious game without letting things devolve into chrome-plated rules spaghetti. I am not a big fan of his seminal States of Siege design, Levee en Masse, which models the French Revolution. It is a solid game that also does a great job of teaching you about the period as you play, but I felt it lacked depth in the long run. The same cannot be said of Cruel Necessity, which is a much deeper and richer experience. One downside is that a full campaign can take three or more hours to complete (especially if you use the Battle Mat for combat). This isn’t a big deal because the major beats of the war are divided into three separate scenarios that play out in about an hour each, but taking in the full scope of the game and appreciating the way it evolves over time requires committing to the campaign. Combat is also something of a letdown because there are so many draws, but that has everything to do with accurately modeling the conflicts of the period and nothing to do with the neat off-map combat system.Welch could have used the streamlined die-roll model and left it at that, but the Battle Mat system adds to the game’s epic feel. Another thing to be aware of is that this game is more complex than most other States of Siege titles, and might be a bit much for people looking for another Levee en Masse or Zulus on the Ramparts. The excellent rulebook is packed with material and looks much more intimidating than it is once you actually start using it, so don’t let that dissuade you from trying the game. 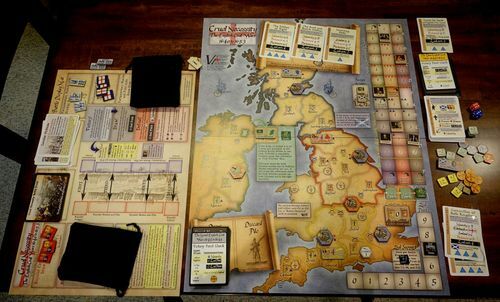 As for me, I’m glad to have another meaty States of Siege game, and am awed by John Welch’s ability to turn any historical subject that interests him into a neat little clockwork of gaming goodness. Cruel Necessity successfully fired up an interest in a topic I had willfully ignored up to this point, and it was interesting to see how educational a States of Siege game could be as I’ve known much about the conflicts in the other historical titles in that series I’ve played. GMT was supposed to have released Cruel Necessity in a three-pack of revamped States of Siege games, but that deal fell through at just about the time Victory Point Games started amping up its graphic design and invested in its laser cutter. What might have been a disaster couldn’t have turned out better. This is a beautiful and polished game that should be on the short list of any solitaire gamer, and on the shorter list of any States of Siege fan. Excellent review. Thank you. I am definitely picking this up when they are back in stock after the holidays. Awesome review! Well constructed, with a super overview of play, and great summary of your thoughts about the game, enhanced by the fantastic photos. A fine review. Sadly, not a game for me: I cannot possibly play Cromwell. I can play as Stalin or Hitler, I can play as Hirohito or Barca or any of the Caesars, but this is one line I personally cannot cross. To play as Cromwell would be scarcely more unpalatable than to play as the actual devil. VPG continues to impress me lately. Their stuff has always been high quality, and now it's gorgeous as well. Fear not, laddie. You don't personify Cromwell in the game. He is simply a powerful resource for the Puritans. It is possible for Cromwell to die in battle. However, the war goes on without him. Perhaps, your animus could justify helping to bring this about. You could consider yourself the 'good' conscience of the Puritan cause. No doubt your leadership would curb the excesses of the Puritan revolution to create a better Britain. You sound just like the man England needs. Or the man Ireland needs, at least. It looks like a fantastic game. But oh! Cromwell... Ireland. Yikes! Maybe if I were wearing a St. Patrick medal I could manage it. *- After all, if all those years of D&D taught me anything, it's that if you kill people *and* take all their stuff you're the good guy. But if you *only* take their stuff that's stealing and it's evil; likewise, if you kill them but just leave their stuff lying around that's murder most foul! Or the man Ireland needs, at least...It looks like a fantastic game. But oh! Cromwell... Ireland. Yikes! Maybe if I were wearing a St. Patrick medal I could manage it. Then the matter is settled. Your role in the Puritan councils of war is to be the voice urging a policy of conciliation instead of pacification of Ireland. It is a perfectly legitimate strategy in game terms. There are even opportunities to criticize Cromwell in Parliament for his Irish policy! Scotland beckons. Of course, your task will be a delicate political matter. But, you sound like the man of the hour. Indeed, if your wise council leads to success, you could win over your internal opponents, including Cromwell. Who knows, perhaps your policy of reconciliation could ultimately lead to the repair of the rift between Catholics and Protestants? One can only imagine the benefits for all Christians. The possibilities are mind-boggling. A really terrific review. Tracy has been added to the BGG Wargame Reviewers geeklist here: http://www.boardgamegeek.com/geeklist/127822/in-praise-of-bg.... Entry #73. A fine review. Sadly, not a game for me: I cannot possibly play Cromwell.... this is one line I personally cannot cross. To play as Cromwell would be scarcely more unpalatable than to play as the actual devil. I sympathize. I'm sorry to say that I have the same feelings about another VPG title: "Hero of Weehawken." I know that Thomas Jefferson is beloved by almost all Americans, but when I think of Jefferson, I think of slavery. "Hero of Weehawken" is a brilliant, unique design. It's a fun game that is infinitely replayable. It's beautiful to look at. I would recommend it to anyone. But I only played it couple of times after purchasing it, because I just can't get beyond the fact that Jefferson was a slaveholder. Plus, if you want a 'slight' added challenge, just don't use him as some sort of boycott of his ideas or methods. You can even create your own chip with another, more palatable, name on it. "But I only played it couple of times after purchasing it, because I just can't get beyond the fact that Jefferson was a slaveholder." You realized that Jefferson hastens the end of slavery importation during his presidency. I believe there is even a card for it. Doing so made him quite unpopular in the South. I can't help it, but I'm squeamish about everything involving Mr Jefferson, but thanks anyway for your comments, Alan. Aaron, if you do eventually buy "Cruel Necessity," I will be very interested to know how [or if] you like it. I also want to thank the reviewer for such a detailed examination of the game. I wonder if anyone here listens to Mike Duncan's "Revolutions" podcast--in recent episodes he deals with this period. I grabbed CN along with Legions of Darkness and A.D. 30 last week and finished my first playthrough of CN today. This game is awesome. Granted I made some mistakes along the way and I posted some questions to the forum trying to get some uncertainties straightened out. There is a lot of moving parts here. A lot to consider. A lot of options. Probably my favorite solo game ever. I cannot wait to see what John Welch comes up with next. My first game involved A LOT of flipping through the rulebook, but my second game played out in just over 2 hours for the full Campaign. There is almost no need to look up rules after a few games. Question: I liked Soviet Dawn and Levee in Masse the first handful of times I played them. But then, honestly, I grew bored with them, as the playtime to decision making ratio was so high. The decisions just seemed really obvious, and the I felt like the game was playing me, rather than the other way around. Does the extra-time/chrome in this game alter that? Those are at the bottom of the States of Siege complexity scale. Cruel Necessity is at the top, and has much higher replayability. I was indeed reminded of the period and drawn to seek this game out by that exact podcast! At the most straightforward level, yes, Cruel Necessity is a much more complex game. There are a lot more moving parts. I can't comment on Levee en Masse. But, unlike Soviet Dawn, it doesn't have that Russian Roulette feel where you can lose the game in a few turns. Indeed, that "OMG, I'm gonna die!" feeling isn't as prevalent (unless things really go south fast which is unusual). Middling play is rewarded with middling defeat or middling victory. The challenge is to win big. To do so, the player has to take risks and know when to throttle up and when to catch their breath. Pacing is vital. The player must know the decks. I haven't played CN very much. Nor have I ever won big. But, I've played enough to realize what I'd have to do to play much better. Soviet Dawn is a much simpler game. My central criticism of it was the lack of depth in gameplay. The player doesn't have many resources. So when things go bad, it can seem "unfair" because it seems there is little to do to prevent defeat. Addressing this dynamic really drove my thinking in creating the Bolshevik edition for Soviet Dawn. Cruel Necessity really advances the State of Siege game engine. From very humble beginnings with Israeli Independence, designers are really figuring out how to use the core game engine. Just wait until you see what we've done with the reboot of The Lost Cause. Lastly, if you feel like the game is playing you, that suggests you don't understand the fundamental nature of a SoS game. The key is to understand the game is all about your aggregate decisions. Over the course of a game, you have a certain number of actions you can take. You always have to be thinking about how you want to allocate them. If you're just doing the obvious all the time, yes, you are being played by the game and very likely are going to lose and have no sense that you are making meaningful decisions. Hopefully, this is more apparent in Cruel Necessity, particularly after you achieve middling victory or defeat numerous times. In CN, making obvious decisions will get you nowhere. Thanks David, that's helpful. In saying that it felt a bit like Soviet Dawn was playing me - what I meant really was that the decisions were just obvious. Roll against the front that you have a bonus on, unless another front is within a space or two of Moscow. Keep the one or two fronts (I forget which) at 5 if possible, in case you draw the card that puts them out permanently if they are at 5. If you have extra actions, roll for politics - and if you get lucky there early, keep rolling for politics. I hate Cromwell with a passion reserved for a few evil notables. I would much prefer to play the Royalist side; likely this reflects my pro-Catholic bias. This being said, I have no problem playing the Roundheads; otherwise, how can I play the game?